Ray Way Tarp and Net Tent on Max Patch along the Appalachian Trail. This was my first Ray Way project. I decided to find an alternative to my 5 pound 2 person lightweight tent. I had looked at the smaller 1 person tents which were still weighing in at over three pounds, had minimal coverage and little versatility. 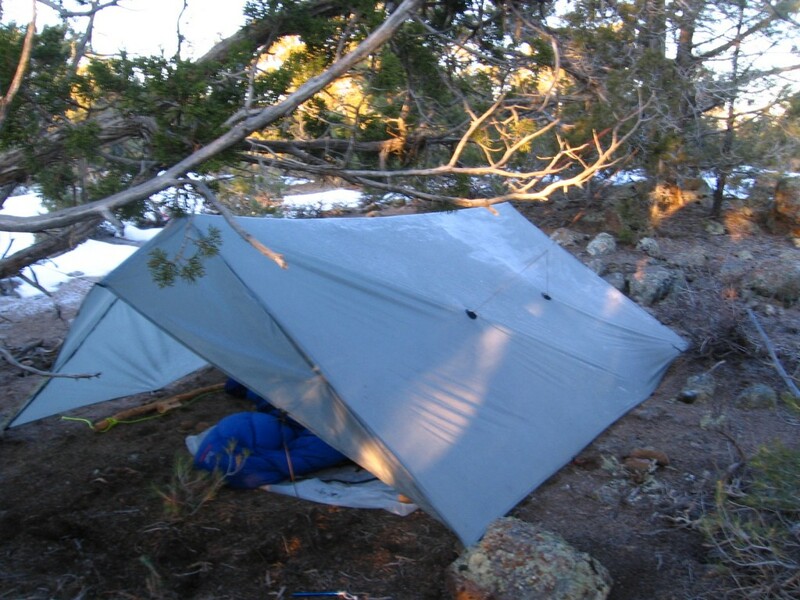 I had looked at the newer “pyramid” and “tarp tent” style shelters which had quite a following on trails such as the PCT. I liked them, the weight was nice and they were designed by actual hikers. I kept searching though, and eventually decided to try a shelter that I had read about in the book Beyond Backpacking (Now updated to Trail Life). It was difficult to argue against the logic of the Ray Way Tarp and Net Tent combo. This shelter system seemed to have the lightest weight to square foot of coverage ratio as well as being the most versatile. 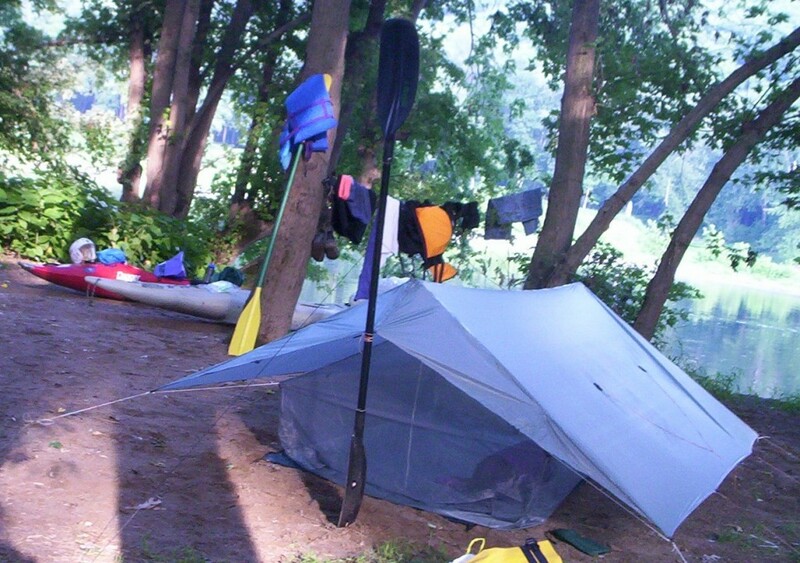 The Ray Way Tarp and Net Tent camp along the Delaware River. 1. )The 14 ounce Net Tent is removable. This can save weight and bulk when bugs are not an issue. For instance, I sent my Net Tent home in northern New Hampshire on my AT thru-hike when the cool weather had eliminated most of the bugs for the year. 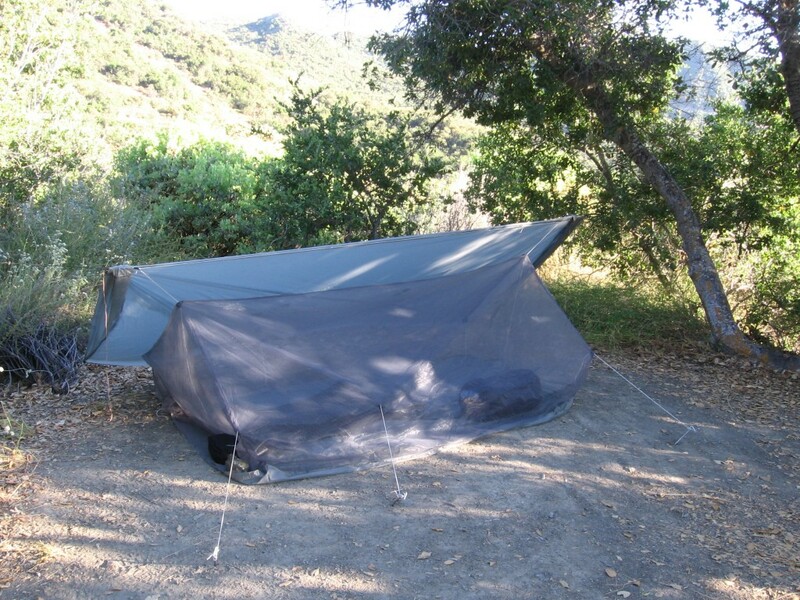 Another great aspect of the removable net tent is that if you are on a trail that has shelters, you can sleep in the shelters inside the net tent. This will help keep bugs and even mice off of you during the night. This is unless of course, the shelter is too crowded. 2.) Variable set up. Although the beaks limit the full diversity of a standard rectangular tarp, you can still adjust the set up considerably. Most of this will be the desired height of the tarp pitch. You can set the tarp up higher and more open in pleasant weather or lower it to hunker down in storms and wind. 3.) Size of coverage area. This tarp is generally a little larger than other ultra light tarps. Although a fraction heavier due to a few inches in material, this extra coverage is well worth it in heavy rains and storms. Remember, rain doesn’t always fall straight down, it can blown in at an angle. There is also the issue of splash back, when heavy rain hits the ground next to your tarp and bounces under in the form of a mist into your shelter. The few extra inches of coverage help greatly with these issues. 4.) Cost. 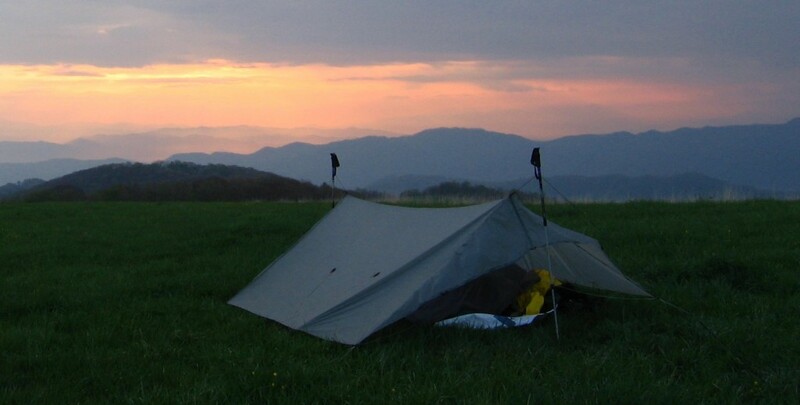 The tarp and net tent kit are less expensive than purchasing commercially manufactured gear. If you can sew and have access to a machine then great, you probably already know how much money it is possible to save when making your own outdoor gear. If you do not sew and are willing to learn, the Ray Way kits are a great way to start. Although I must warn, working with sil-nylon can take some getting used to. It is very slippery and requires a slower than normal sewing pace. But don’t let that stop you! The end result is well worth it! The Ray Way Tarp the morning after gusty winds and sleet in Dixie National Forest Utah. There are many great things about this set up. There are also a few considerations that must be noted. 1.) At this time, the only way to have a Ray Way Tarp or Net Tent is to make them yourself or have someone make them for you. 2.) 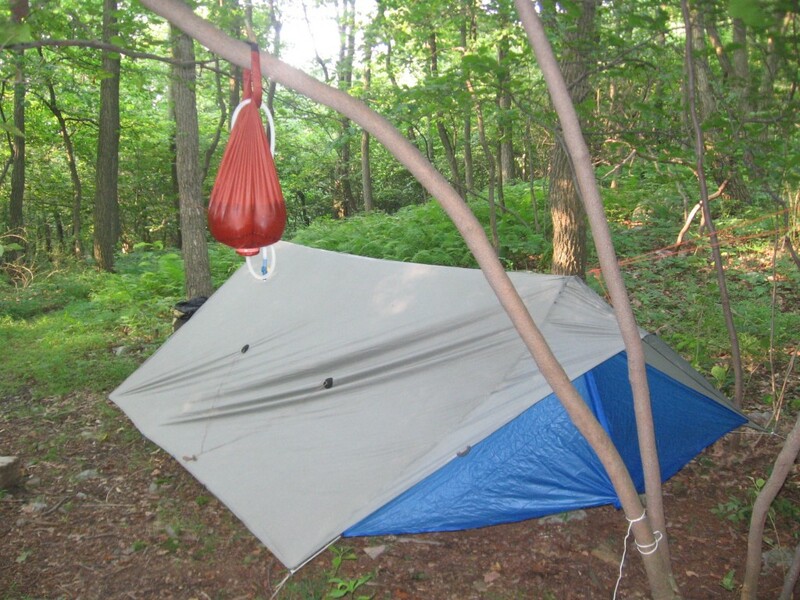 There is skill required to use a tarp when camping, especially when it matters most during foul weather. If you are not already tarp savvy, you will need to learn some new skills and do some practice runs in a safe environment before heading into remote areas. I practiced in my backyard, learning how to set up in wind and rain before heading out onto the trail. If you do not have a yard, a local park might do. If you opt for a Ray Way Tarp, you would most likely purchase the Ray Way Essential Tarp Book with it, this would provide a detailed explanation of the skills needed. I have been using my Ray Way Tarp for most of my backpacking trips since 2005. It has about 3,000 miles on it and still works great. It has held up through many wild storms. The waterproof integrity of the sil-nylon material has not declined. My amateur sewn seams, although not the cleanest looking, have held up without issue. One of the nice things about this shelter is that I can usually watch the storms from under the comfort of the tarp. In a tent, one can only see the walls of the rainfly. 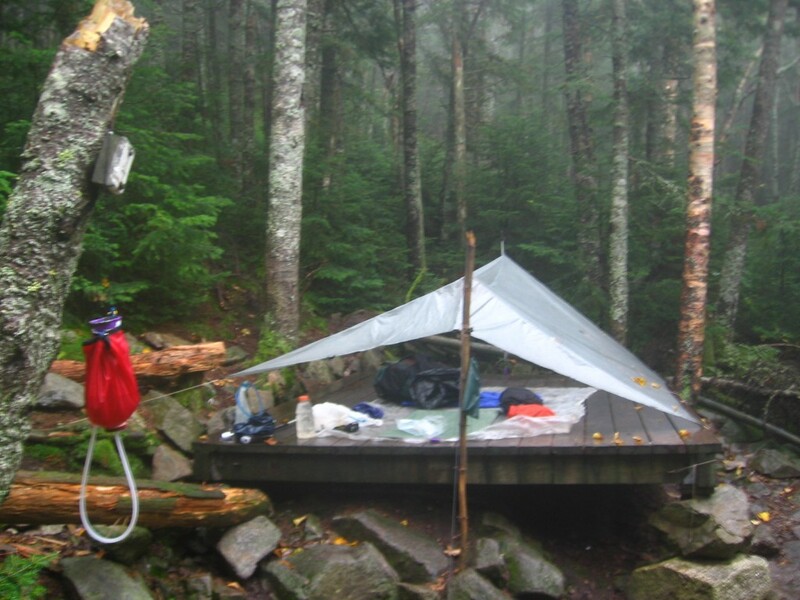 The Ray Way Tarp set up on a tent platform in the White Mountains of New Hampshire. 1.) After a few years of walking into the black ridge guy line (the main line that runs the length of the tarp), I replaced it with high visibility orange spectra core line to reduce my walking into it, especially at night. This line is a little thinner and stiffer than the supplied cordage, but it is much more visible and a little lighter in weight. This is sold as Liteline available at Mountain Laurel Designs. 2.) After five years I had to reseal the ridge seam with silicone. It had started to drip in heavy rain. This was a simple process and is much easier than resealing a tent. 3.) A few times I had experienced splashback in heavy rain. This occurs when camping on hard ground and the rain drops shatter on impact into a mist that creeps into the shelter. I have had this happen in tents also, but the problem is worse under tarps. Sometimes blowing rain is also an issue. It is somewhat related to splashback in that they can be helped by having extra coverage. I decided to add a Ray Way BatWing (see photo below) to my set-up to help alleviate this. It is an extension of the tarp beak that helps to deflect rain away from the entrance. I found it useful for times when storms and rain were common, but it is not essential to the function of the tarp. Think of it as an aid. The Ray Way Tarp with a BatWing installed. Along the Appalachian Trail in Pennsylvania. Note the gravity filter in the foreground. The Ray Way Tarp and Net Tent in star gazing mode. Los Padres National Forest, California. 4.) I added a zipper to the Net Tent. I found that crawling insects would still sometimes find their way into the Net Tent. After adding the zipper, they do not. It now is offered with that option. 5.) I added an extra hook to the top middle of the Net Tent. This allows me to secure the middle of the Net Tent to the “clothes line” that runs along the interior of the tarp. It keeps the middle of the Net Tent from sagging. 6.) One person or two person tarp? My experience here is with a two person tarp. A one person tarp would save a little weight and have a smaller foot print. It might even be a little easier to set up. I must admit though, I have really enjoyed the large coverage area of the two person tarp. Someday I would like to make a one person version so I could better compare the two. If you have any experience with these items please feel free to comment below! After years of Golite Shangri-La1 & 2, I’m about to sew a DIY Ray-Way tarp after having read his book (Ray Way Tarp). I’m just missing the dimensions of the beak. Could you help me with this part pls? Hi Vince, are you sewing a 1 or 2 person tarp?